Summertime is here..the Coachella Valley sweat is ON! The road to the Coachella Valley HEAT is well on it’s way! Summertime is here..the Coachella Valley sweat is ON! As the temperatures stay steady in the triple digits, the Coachella Valley residents are hunkering in for the duration. I’ve been a desert local for 35+ years! A polo player based here in the desert for 18 years, and now a realtor for the past 18 years. Hard to believe, but the heat has just become part of the Local daily life. If you’re looking for a desert home, the summertime is not a bad time to hustle out there in the heat and see what’s there! Call Kim Kelly at 760-285-3578. 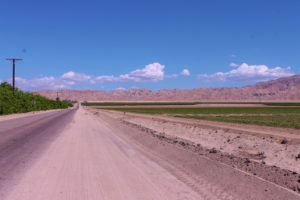 If you choose to come to the desert in the summer time, one of the really great things that you’re going to experience is much, much less traffic! Another one of the summer qualities that we locals really enjoy is the number of happy hours at our local clubs, bars, and music venues. This is true for any of our desert cities. If you are in the west valley city of Palm Springs, most of the local shops and eateries remain open, although many owners still leave the valley for the month of August. If you’re planning on coming to town and staying in Palm Springs, or any of the nine desert cities, be sure to call the restaurant or nightclub that you’re thinking of visiting, to confirm they are open. August and September are our two hottest summer time months, so that’s when local owners will tend to leave for a break. VIEW from a courtyard can often be a buyer top request in the desert. If the center of the desert valley, cities like Rancho Mirage and Palm Desert, are more to your liking, the same will hold true for the shops and restaurants on El Paseo. Happy hours are many and varied, great deals on featured wines, bar specials, and lots of food. It is also a great time to look at real estate throughout the Coachella Valley, if you can stand the high temperatures. My Sellers used to take their properties off of the market in the summer time, and then re list them as we got closer to season. However, our summer real estate showing season has pretty much become year round. It’s not as busy in the summer, true, but there are always people looking. Remember that if you’re a golfer, the summer golf courses offer spectacularly reduced rounds of golf. The property VIEW down the fairway, in the tour below is located at PGA west in La Quinta. Enjoy!